OAKLAND, CA (July 26, 2017) – Prospera Community Development (Prospera) is pleased to announce that it has received a People, Place and Power Equity Grant from The San Francisco Foundation in the amount of $50,000 to increase sustainable economic opportunities for low-income immigrant women to launch their own cooperative businesses across the Bay Area region. Prospera is one of 140 grantees to receive an investment from The San Francisco Foundation. 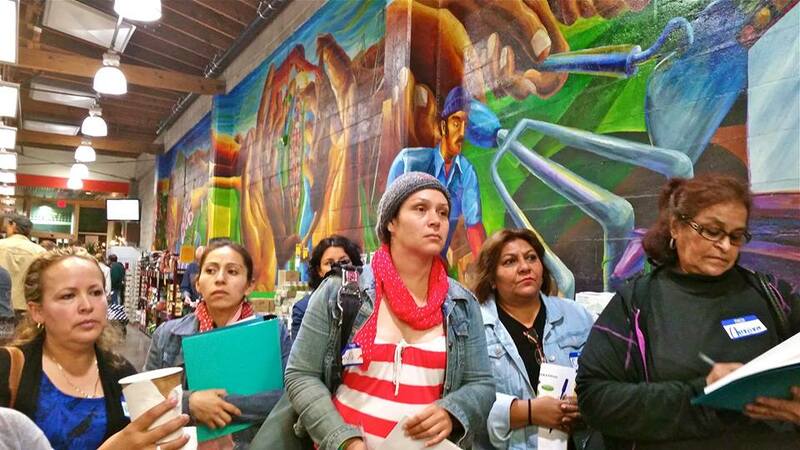 Headquartered in the Fruitvale District of Oakland, Prospera provides community education opportunities and an intensive cooperative incubation program for Latina entrepreneurs. The nonprofit provides much needed access to culturally-specific technical assistance, business development training and coaching to support the launch of successful cooperative ventures. “At Prospera, we teach the co-op model so that Latina entrepreneurs can come together to pool resources, complement strengths, engage in democratic decision-making, and have a voice and a vote in all major business development decisions,” said Maria Rogers Pascual, Executive Director at Prospera. “We provide aspiring Latina entrepreneurs with the kind of resources that meet them exactly where they are.” Prospera takes the best of what exists in start-up businesses and the co-op field, and converts that into Latina-centered trainings and tools, all in Spanish. Worker-owned cooperatives are increasingly being recognized as alternative options for building more equitable economies across the globe. These values-driven businesses put worker and community benefits at the core of their purpose. By placing worker needs before investors’ profits, successful cooperatives democratize wealth, rather than concentrating it in a few owners. Prospera envisions cooperatively owned businesses as a means to preserve culturally vibrant, Latinx dense neighborhoods across the Bay Area. The organization’s Community Education and Cooperative Incubation programs builds on 20 years of experience developing successful green house cleaning cooperatives. Over the last two years, the organization has been piloting and expanding a bold new program model that taps the leadership of Latina entrepreneurs as a means to create more equitable and sustainable local economies. Prospera is an Oakland-based nonprofit organization founded in 1994 and is the only nonprofit in the U.S. that focuses exclusively on developing and launching cooperative businesses owned by Latina immigrant women. Prospera has a proven track record of partnering with low-income, immigrant Latinas to create worker-owned cooperative businesses, which build wealth and leadership capacity in communities of color. The organization has been nationally recognized as a leader in the field of co-op development in low-income immigrant communities and the new program takes an innovative approach to co-op development in the field. Since the organization’s founding, Prospera has incubated eight cooperative businesses that benefit low-income Latinas. These businesses sustain nearly 100 high quality jobs and earn over $3 million in sales each year, while also bringing eco-friendly housecleaning services to more than 2,000 customers in the San Francisco Bay Area. The co-op owners—all Latina immigrant women—have tripled their incomes on average. Prospera’s new programs were designed and are facilitated by bicultural and bilingual Latinas. For more information, visit www.prosperacoops.org. With more than $1.3 billion in assets, The San Francisco Foundation is one of the largest community foundations in the country. The Foundation is committed to expanding opportunity and ensuring a more equitable future for all in the Bay Area, and working with its donors, it distributed nearly $100 million to nonprofit organizations last year. The San Francisco Foundation serves, Alameda, Contra Costa, Marin, San Francisco, and San mateo Counties.